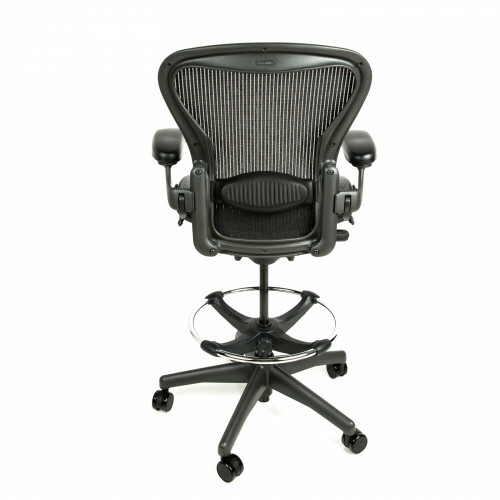 A highly popular variation of the fully loaded Herman Miller Aeron chair - the iconic and bestselling office chair ever made - the Herman Miller Aeron Chair Fully Adjustable Graphite Size B Drafting Stool by Beverly Hills Chairs is the go-to selection for companies and individuals in search even greater flexibility and optionality. The drafting stool provides a boost in height and a greater height range relative to the traditional Herman Miller Aeron chair. The choice of many production companies, video editors, designers and personnel across industries from entertainment to healthcare to technology, the Herman Miller Aeron Drafting Stool has proven to be one of the most durable chairs on the marketplace, as the high quality of materials and supreme craftsmanship make the Aeron a great investment for professionals seeking the rare combination of high-end design, stability, reliability and performance. The Herman Miller Aeron Chair Fully Adjustable Graphite Size B Drafting Stool by Beverly Hills Chairs comes in the classic and most popular color; the size that best accommodates individuals with smaller and lighter frames; and with the features that will your make your seating experience all the more flexible, enjoyable and ergonomically sound: fully adjustable arms, tilt lock and lumbar support. Enjoy the comfort and luxury of the chair that not only serves your back, but serves as an internationally recognized symbol of wealth and luxury, while saving a substantial amount of money by buying from Beverly Hills Chairs. 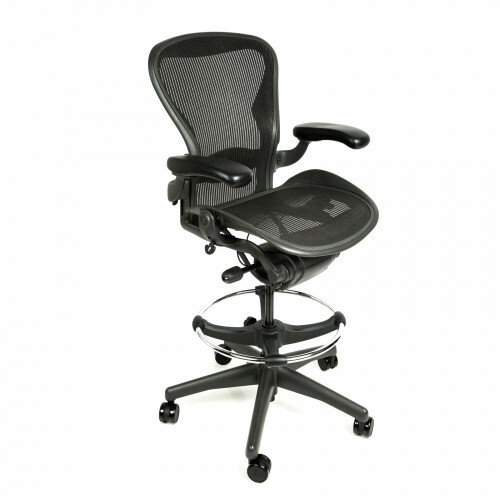 Added Height and Greater Height Range: The Herman Miller Aeron Chair Fully Adjustable Graphite Size A Drafting Stool by Beverly Hills Chairs provides additional height and a greater height range, providing enhanced optionality in adjustability and flexibility. I'm a short person, so having the option to adjust my chair's height is great. 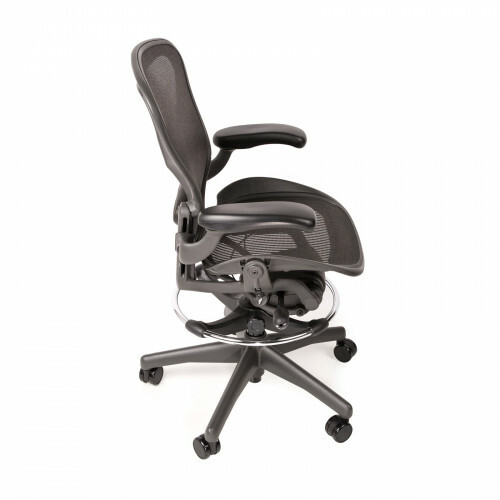 This Herman Miller Aeron Fully Adjustable Drafting Stool is the perfect chair. I can lift my chair and the footrest makes it feel like I'm in a regular office chair. I was hesitant about purchasing a refurbished office chair. I've read horrible reviews all over the internet about refurbished furniture and didn't really want to take a chance. After reading other reviews about Beverly Hills Chairs, however, I decided to take a chance. You can't even tell that these Herman Miller Chairs from BHC are refurbished. 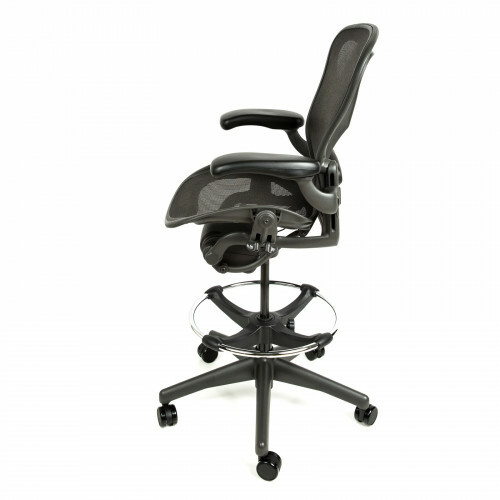 You'll love these office chairs! 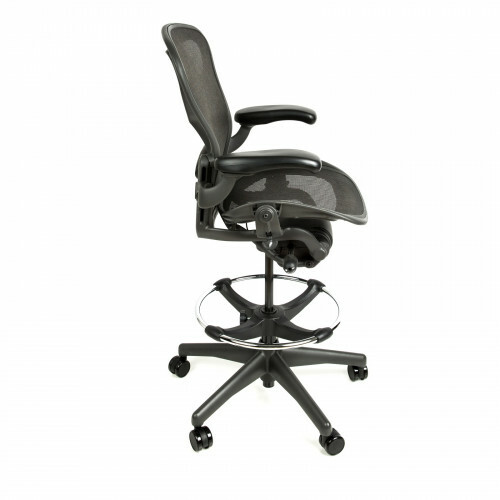 Love this Herman Miller Aeron Drafting Stool. It's comfortable, rolls around easily, and it looks nice. From the hardwood casters to the lumbar support, I love this chair! It's a very good deal. This chair feels incredibly sturdy. I have a tall desk, and this is the perfect chair for it. The seat is very comfortable and large. I'm happy with it and I think it looks really nice. I absolutely love my new Herman Miller Aeron Drafting Stool. I'm an illustrator, so I spend a great deal of time at my drafting table. Having a chair that adjusts so easily and is extremely comfortable really increases my productivity. Thank you, BHC!